Here's another example of a recipe that should NOT be made in the microwave...EVER, under ANY circumstances. I suppose this is meant to be applicable for quick meals, college dorm residents, bachelor apartment dwellers, etc...but just don't do it. The main faux pas I'm talking about? Using a microwave to BAKE a potato. Never again! Oh, this recipe had so much promise. 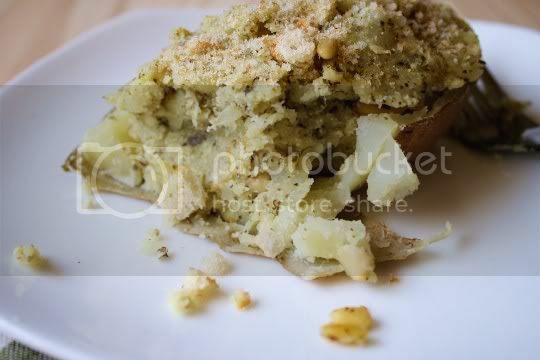 A twice-baked (or nuked, rather) potato with a delicious Mediterranean-style filling. Sounds good, right? Well, it probably would have been amazing had the potato actually been baked. I've never baked a potato in the microwave because, well, why would anyone do something like that? The recipe suggests a quick 3-5 minute nuking time. I don't know what kind of superpowered microwave they were using at Vegetarian Times, but mine took about triple that just for the potato to yield to finger pressure. And then when I cut it in half, imagine my surprise to find it was still hard in the middle. FAIL! As a result, scooping out the flesh was extra tricky and some of it was even still hard! Anyway, once you get past all that nonsense, simply mix/mash together the filling ingredients of chopped artichoke hearts, pesto, pine nuts, and tofu. I'm not quite sure what the tofu did, other than give it a little extra texture, so you could probably omit it if you wanted to. 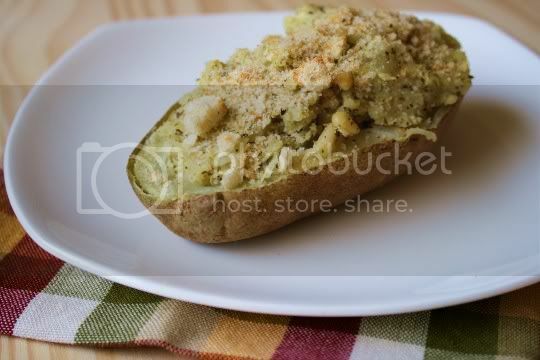 Fill the potato shells with the mixture, renuke, top with crushed croutons, and serve. Now don't get me wrong, the flavors actually weren't too bad. Pesto in anything is a winner to me, and the tangy artichoke hearts and salty croutons were a great pairing. The pine nuts gave the mixture some crunch and texture...again, I'm not sure what the point of the tofu was. The potatoes were actually a little dry, so I'm thinking maybe it was there to add some moisture. However, I think something like a little unsweetened soy milk would have been a better ingredient, and would have made the mixture a bit more creamy. Make again? Maybe, only going the REAL baked potato route next time. 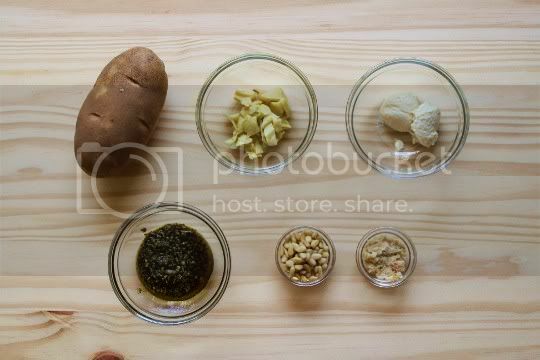 Vegan variation: Use a vegan pesto.